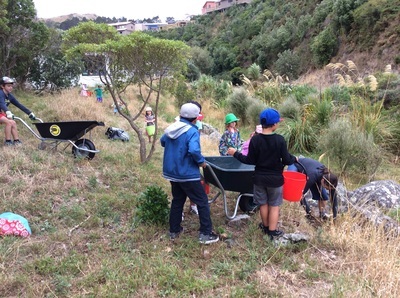 This page gives information about specific outdoor projects and programs that are happening at schools in New Zealand. Te Aro is an urban school nestled into the hillside of a Wellington neighborhood. Although the school is built on a foundation of asphalt, every bit of nature that surrounds the campus is accessible to the students and even more has been cultivated and incorporated for educational purposes. Te Aro principal, Sue Clement, was gracious enough to take me on a tour and has invited me back to assist in honey extraction from one of their two campus bee hives. You can learn more about the honey extraction process on the below. I spent the day at Te Aro school with year 4/5 teacher, Claire Tocher, and beekeeper Martin Toland. In just one day I learned so much! The videos below will walk you through most of the steps for the honey extraction process, from taking the frames out of the have to spinning the honey out of the frames. The videos speak well for themselves. The first is the whole day in one video and then they are also posted in segments to make it easier to locate specific parts. In addition to the science that is happening in the videos, it might be fun to use them to write a whole class procedural text on the process of honey extraction from the hive. With a name like El Rancho, I felt right at home at SWIS's term camp. This is the school where two of my sons are going, so I got to look at this experience not just through the eyes of a teacher, but also a parent. They run three three-day, two-night camps over the course of two weeks to accommodate all of the students. The cost of the camp is $95 USD per student. The teachers organized the camp and ran it on a tight timetable, but within that time the students had a lot of freedom of movement over a large area. Campers were divided into groups to attend the following activities: archery, horseback riding, swimming, a river walk, team initiatives, team challenges, mixed sports, volley ball, orienteering, and a water slide. 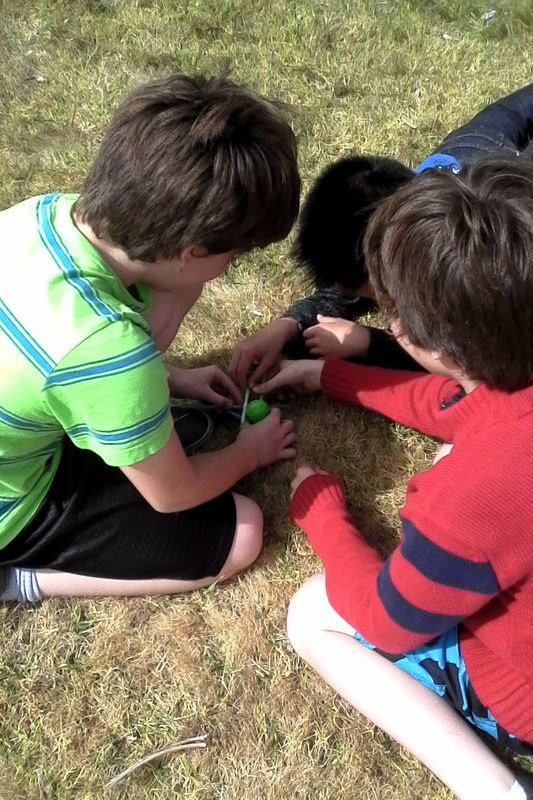 Several of the activities had a strong team building focus and it was very interesting to watch how different groups went about problem solving. 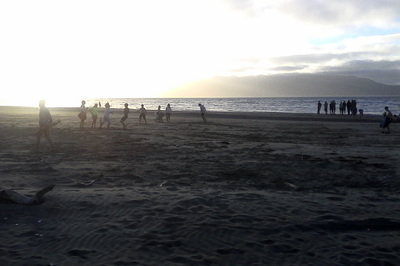 There were also whole group activities each night. 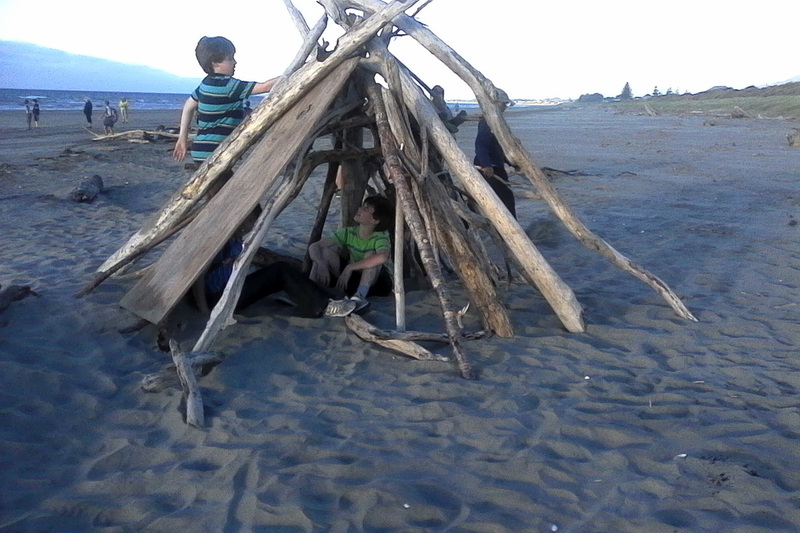 One night we went for a walk to the beach and the kids had a choice of what they wanted to do when we got there. 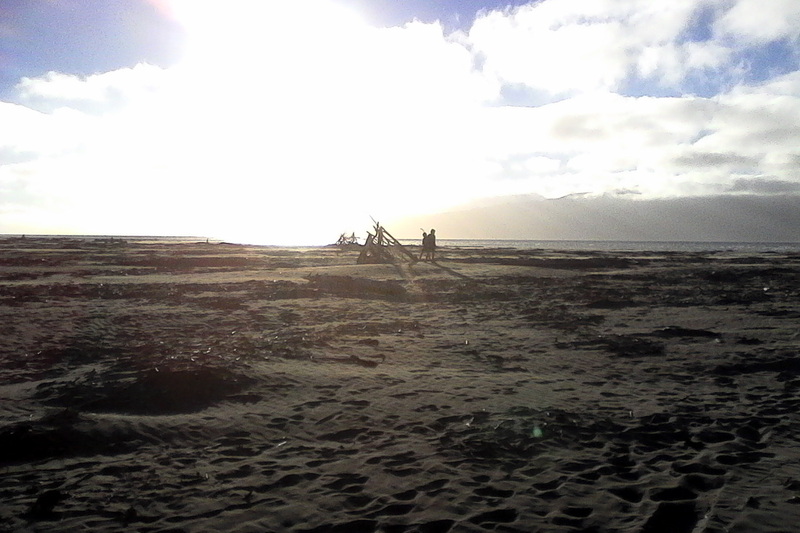 It was a bit windy and chilly, so many preferred to stay on the sand and build structures out of large pieces of driftwood while others braved the water. The next night everyone participated in a version of the Amazing Race that took the campers running back and forth across the entire camp land. I couldn't believe the kids had any energy left after that, but they still were able to put on a talent show. Each group only had 20 minutes to prepare their act, so there was a wide range in the quality of the performances and a lot of laughter. I can see how the time spent in the activities really did make my children feel the connections with their classmates. On a personal note, one of my sons went to camp saying he didn't know how to make new friends (at home he has had most of his friends since kindergarten). The following Monday at school, he came home telling me how glad he was that one of his friends helped him out in his German class. I wish this kind of camp was an opportunity all students of this age could have. 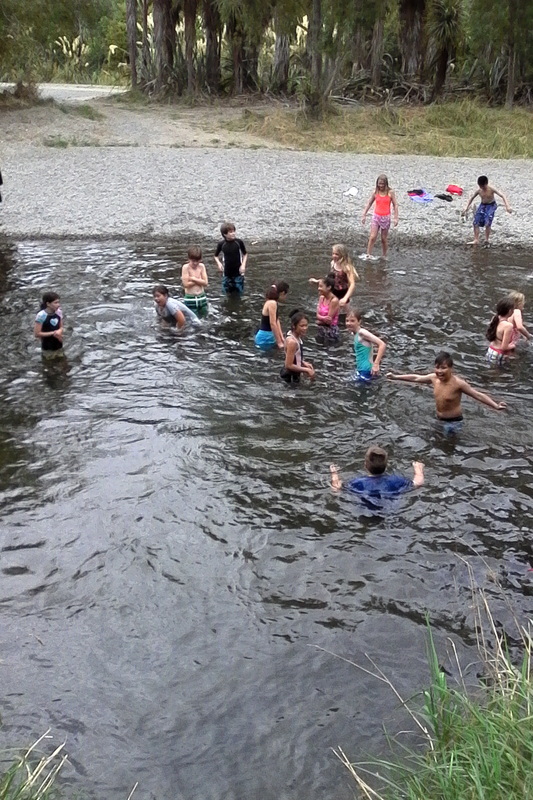 Owhiro Bay School has been utilizing the stream behind their school as a space for learning off and on for the past ten years. Back then the classes who wanted to go there to study found huge amounts of rubbish that had been dumped (probably by people who didn't want to pay the fees at the local landfill). 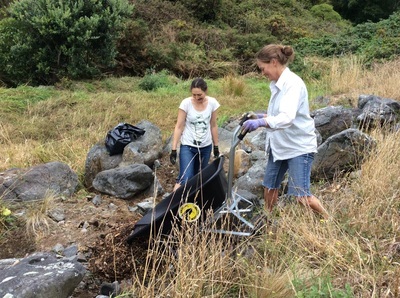 The first project they undertook was clearing the trash to reclaim the water way. Like any outdoor project on a school campus, it takes a lot of work and dedication to keep it the area maintained. I had the opportunity to sit in on this year's planning meeting that was lead by a parent volunteer and attended by both parents and school faculty. Just since last year, the banks along the stream have become overgrown with grasses and some of the native plants that were added have grown in areas where they weren't intended. The first steps this year will be to clear two areas that provide enough space for teachers to take their classes for observation and study. One way they will start to tackle the weeding of these areas is by having one morning each week where parents can volunteer to come help out and also have coffee with others in the school community. Garden club member will also be able to assist during their morning tea time on these days. The stream team will be working on a long term maintenance plan for these areas. They are looking to find community partners who can commit a team to come out once or twice a year to assist in the bigger clearing projects. They will also have another planting day this year that will allow all students in the school to participate. 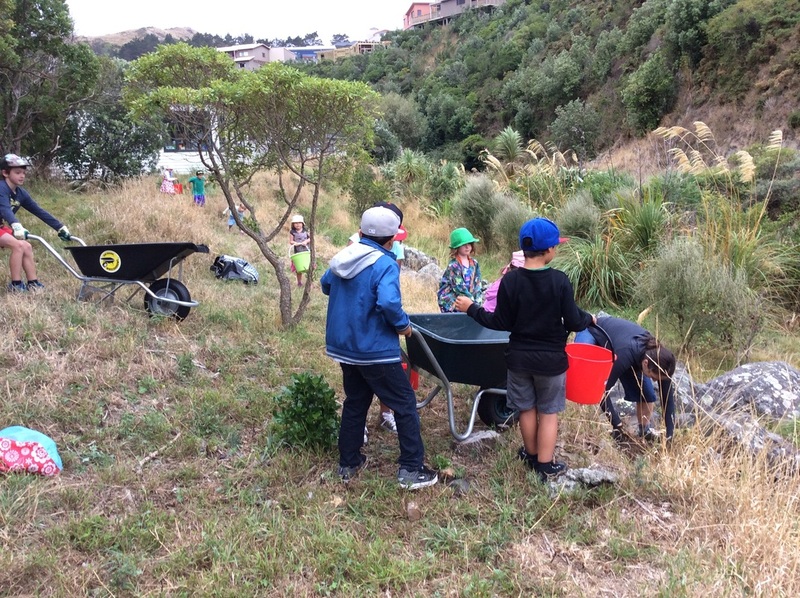 Owhiro Bay School Weeding Wednesdays! 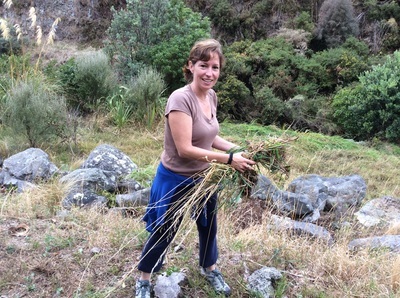 A couple of parents organized Weeding Wednesdays which is a time for parents and community members to jump in and lend a hand a maintaining the areas around the stream so teachers will have space to take classes to visit. During their morning tea time, students may also volunteer to come lend a hand. This is a great way to get the whole community involved in taking care of this precious resource. Just half a block from Owhiro Bay School are the neighborhood's community gardens. This beautifully cultivated space has an abundance of learning opportunities for students. Two, out of the ordinary treasures that were shown to me are the pods of longfin eels that call the stream that runs through the garden home and the hydraulic pump system that has been rigged to irrigate portions of the garden that aren't as close to the stream. View the pictures below for a peek inside the garden. 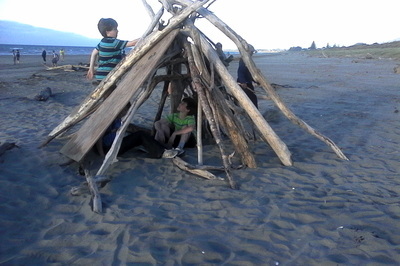 Island Bay School is a located just one mile from the beach in the town of Island Bay. The school is learner centered and uses inquiry learning as the main approach for instruction. As stated in the school developed curriculum guide. The context and the content is not fixed. This gives teachers the flexibility to build their lessons using their unique set of professional skills, and it allows teachers and students the time they need to to explore topics together. Island Bay is fairly progressive in its educational philosophy. Grade levels share rooms and spaces and develop workshop style lessons based on the needs of the students. Education is happening inside and outside of the classroom each week. Among the many interesting and progressive happenings that are taking place at Island Bay School are two inspiring programs. One is the Learning Hub, and the other is called Freedom Fridays. Learning hub coordinator, Karin Grice, discussing garden building plans with a new parent. The Learning Hub is an ongoing program that accesses the skills of the parents to be used as educational support. Learning Hub Coordinator, Karin Grice, serves as a liaison between parents and teachers. As she gets to know parents and learns more about their skills and interests she captures and takes notes of these talents. When teachers come to her seeking expertise on a particular project, she is then very often able to connect them with someone from the school community. 2. An inviting & inclusive space where parents/caregivers & subject matter experts can join us in sharing their interests, expertise & specialist knowledge with us. 3. A social, meeting & networking space where Parents are invited to use the Learning Hub from 9:00am - 9:30am every day of the week to partake in a hot drink and catch up with friends. We also have a coffee machine available for parents and guests to use, with Nespresso cups of coffee costing just $1.00! 4. The Learning Hub is fully resourced venue well equipped to cater for local & wider community groups who wish to meet and gather for educational purposes. Freedom Fridays are another way Island Bay School gets parents involved in educating the students. There are three rounds of Freedom Fridays throughout the school year. For one hour each Friday for seven weeks parents volunteer their time to lead a workshop about something they have expertise in or are passionate about. For this first round the students are offered classes including, but not limited to, limestone carving, skateboarding, mountain biking, sewing, digital photography, coding, crafts, gardening and insect study, Lego robotics, and home design. Students stay with the same activity for the entire seven weeks, giving them the opportunity to explore new interests in depth outside of the classroom. Friday, March 13th, year 5 students from Island Bay School visited Tapu Te Ranga Marae to lay a hāngi in preparation for the hakari (feast) they would have at the school that evening. A hāngi is traditional Māori method of cooking. Meat and vegetables are wrapped and placed in large wire baskets. A fire pit is prepared with rocks and metal irons added to the wood. When the pit is hot (approximately three hours) the baskets of food are placed into the pit and covered over with the hot ashes. The food is left in the pit for another three hours and then uncovered and served to the community at the hakari. Students worked in groups cutting and peeling vegetables and then assembling aluminum trays that would be put into the hāngi. 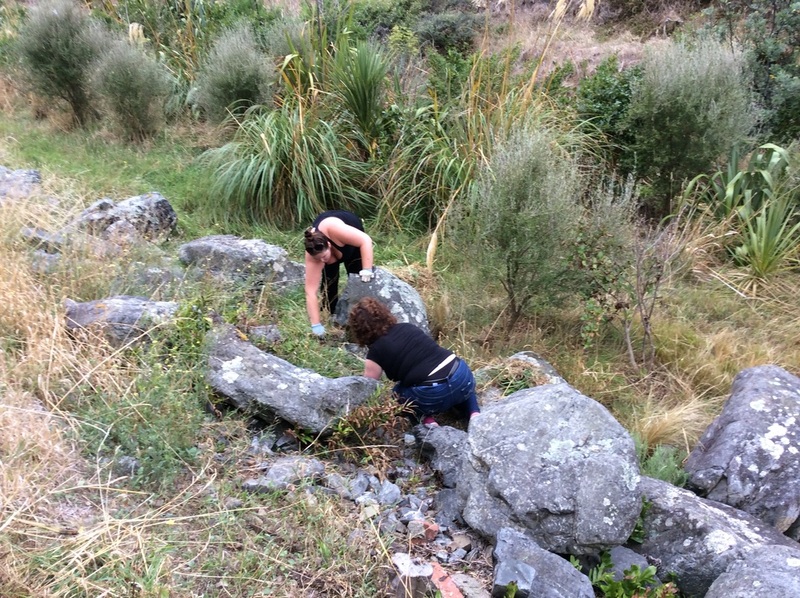 While students were waiting for their turn to help with the preparations they took a hike in the hills above the Marae and enjoyed the views of their community and surrounding environment. Tapa Te Ranga Marae is a unique and special place. To learn more about it visit their website at http://www.taputeranga.maori.nz/index.php. There is an old abandoned building just up the hill above Island Bay School. My daughter's teacher took her class there using it as the subject for a creative writing assignment. They had just finished a poetry unit where they had practiced using literary devices such as similes, metaphors, onomatopoeia, and alliteration, so the imaginative descriptors were fresh in the students' minds. The focus of the the first lesson was to zoom in and zoom out to gather descriptions of the building and it's grounds. At that point, the students knew very little about the building, but they had loads of questions. On a second visit, the students built on their first descriptions and started piecing together their introductions for their stories. With their observations grew their curiosity. After working on their stories, students got together in small groups to research and learn about Erskine College (the name they discovered during their observation walks). The groups then used the Book Creator app to create books of research their findings. I should get a copy of one of the research books to share when they are finished. In the meantime, to learn what Wikipedia has to say about Erskine College click here or to read a nicely written blog about it, click here. In 2001 Mrs Anne Porter and I attended an Enviro Education Course inviting schools to consider integrating Environmental Education into their school curriculum. Later that year a year six student researched the ‘Litter Problem’ at Ashburton Borough. He gathered 12,000 items of rubbish, on one school day, counted and classified the rubbish. In his report back to the class he said that it was unfair that students were not accepting responsibility for their rubbish and teachers weren’t helping either. His suggestion was that a group of interested students and teachers be formed the following year to look at educating students and working towards using sustainable practises to minimise the waste the school was generating. Ashburton Borough became a pilot Enviro school under the Ministry of Education. The Enviro Team was created; five students and a teacher. In 2003 the Enviro Team (17 students and 3 teachers) successfully sent the school incinerator to the scrap merchant and started a student led rubbish classification system. In 2005 Ashburton Borough became a bronze level Enviroschool with the Waikato Regional Council. By this time there were twenty five Greenies. Several outdoor trips, working bees, the introduction of Enviro practises and learning ideas as part of Ashburton Borough Inquiry learning and the school became a Silver level Enviroschool. 2007. 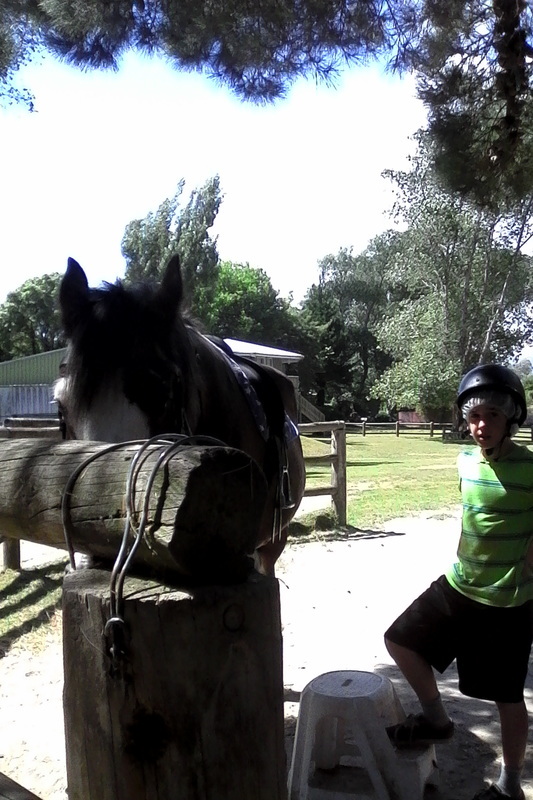 In 2009 Education for Sustainability was being taught as part of Inquiry learning and being caught/taught by: influential students, members of Forest and Bird, interested members of the public, local firms,Wastebusters, Ashburton District Council, Mitre 10, Ashburton Domain staff. Much of this learning was organized by members of the Enviro Team. The school became the first in the South Island of New Zealand to become a Green/gold Enviroschool. The Enviro Team voted to change their name to the Borough Greenies. Working bees were well established and occurred in Autumn, Winter and Spring. With Community help much was achieved. The rock garden was created in 2003, Birdhouse area 2006, Native Nursery 2009, mara ataahua..native garden 2009, organic garden 2007, orchard 2008, pansy garden 2009, the mound project 2011, tree planting in the school grounds and at various places in Mid Canterbury. Wastebusters Trust have given tuition in using sustainable practices every year since 2001. Worm farming, paper recycling, rubbish classification, eco building, conservation of water, composting. In 2015 there are seventy seven Borough School Greenies. To an outside observer it may look as if the greatest benefit is the creation and maintenance of gardens but in actual fact it is the changing of attitudes of the students themselves. This ties in nicely with the PYP Inquiry learning ie Developing learner profile attitudes. Students take action to solve local environmental issues. This runs alongside and often part of PYP Inquiry learning. Students learn to make decisions and care for the environment. Students who participate in several enviro activities build up a wealth of knowledge and pass this on through the Greenies to younger members. Ako learning and student driven action is very much a part of Borough Greenie life. Junior Greenies (yr 2-5) meet on a Monday lunchtime. Senior Greenies the following lunchtime. Junior and Senior leaders attend both meetings. As a teacher/leader who has been involved since 2001 I have found Enviro Education extremely rewarding and have made many personal friendships with students and their parents/grandparents, friends and family. 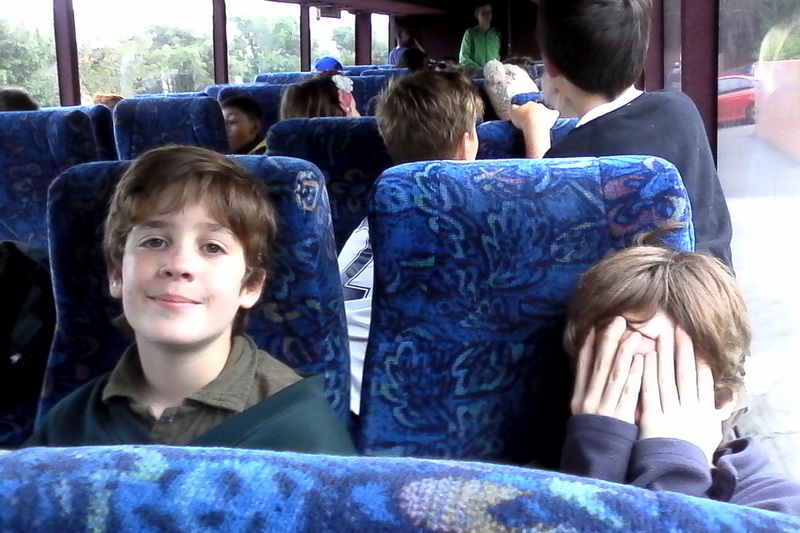 The worms, school chooks, native birds and insects are always pleased to see students of all ages. The plants appreciate being watered and fed worm fertiliser, created by students. Nature has been kind and therapeutic to students and teachers at Ashburton Borough. This year Ashburton Borough School will take part in a national Review to see if they keep their Green/gold flag. It is part of Corinna School's vision for their students to, "seize the opportunities offered by new knowledge and technologies to secure a sustainable social, cultural, economic, and environmental future for our country," and this is exactly what I saw when I visited the campus. The students I met took pride in the work they have done to improve their campus. They showed me the gardens they have been growing over the past three years. The food is shared with families in the community and used for making snacks and topping pizzas in their canteen. Each class had planted fruit trees to beautify the grounds and provide nutritious snacks for students the previous year. The children who were taking me on the tour were delight to show me their particular tree. I had the opportunity to visit a class where the students were hard at work making presentations to share their reflections of the three day outdoor camp they recently attended. They were working on laptops and writing about what they did well at camp and whether their was anything they needed to improve on. The kids were super enthusiastic to play me the video they made to get a grant so every student in school would have access to a laptop. They said they are using these computers to get students writing making presentations about their learning indoors and outside the classroom. They also gave me permission to share their grant submission video with you here. Bush building and bug hotels are regular happenings at Ridgeway Full Primary. After teacher, Colette De Vere Green, met with me and showed me around campus, my question, "What are you doing in the way of outdoor learning?" became "What aren't you doing?" There is no separation between what is being taught inside and what is being taught outside. One unique feature that this school has is that it is built on a forested hill. 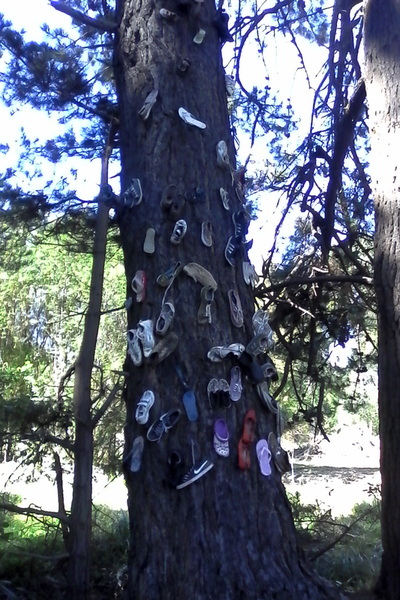 Here they call it "The Bush," and the students are allowed to play among the trees. In a very organic way they have pathways and hideouts, and in the process are learning about land stewardship. When the bush was opened to the kids to play on a few years ago, they immediately saw how running across the steep banks accelerates erosion. They also learned that the area is a precious ecosystem. Through a partnership with the local zoo, the students have been learning how to identify and care for the birds and insects that live in the area. Students have also been devising plans to prevent erosion and the zoo is donating plants to assist, and certain areas remain off limits to protect vegetation. By having this unique outdoor space to make discoveries, students bring what they are learning outside back inside for learning. One class was doing an inquiry lesson on bug habitats and decided to build bug hotels that provide what the bugs need to survive. These are made of natural flax fibers that are abundant in the bush area and have been placed around campus as a refuge for the bugs. Otari School has a rare three strand program. Students can enroll in the Moari Immersion program, the Montessori program, or the Standard program. While all programs have similar curricular content, the way it is delivered to the students varies. Each strand does have outdoor education programs and runs their own three night camps for their upper level students. One interesting program the standard strand participated in for several years was called Bush Guides. Otari School is located adjacent to the Otari Wilton Bush, which is a botanic garden that connects to wilder bush trails. 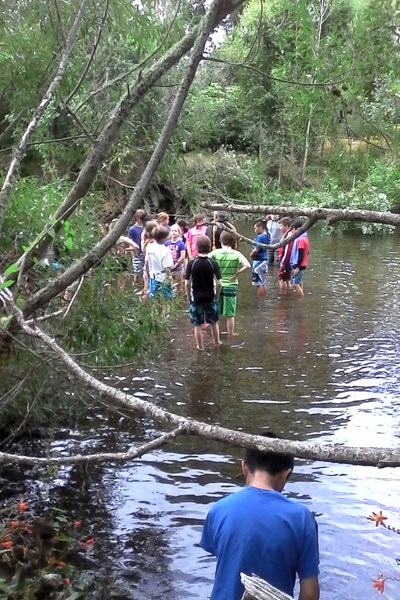 The upper level students studied the plants and birds in the bush and then created and led tours for the younger students. 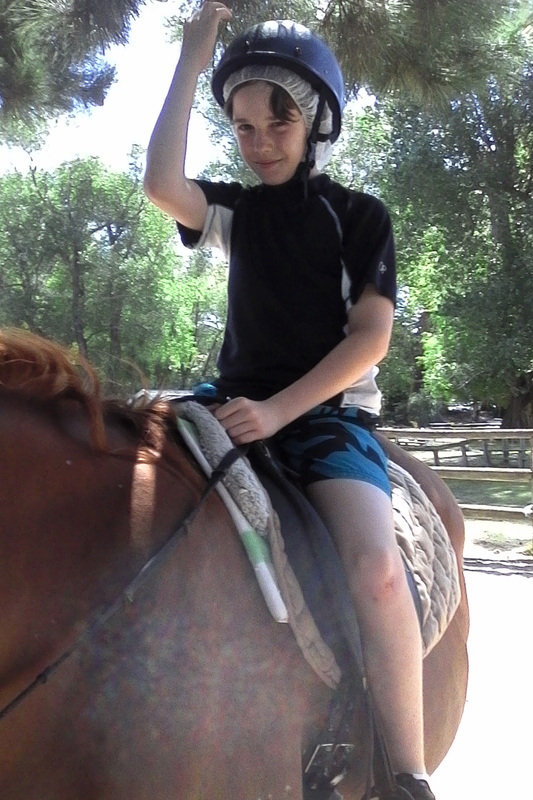 The Montessori program participates in student led "Going Out" trips. Students research learning opportunities in the local community and, with the help of adult facilitators, coordinate discovery trips they can either walk to or take a bus. This school also has a great understanding of the students' needs for unstructured playtime and exploration. They are in the process of partially clearing a portion of unused hillside to create a Wild Space. This is an area that they will provide basic raw materials such as tires, lumber, branches and let kids discover what they can construct on their own. Before I arrived at the school I was told that I would love it up on the Coramandel Peninsula because everyone is so outdoorsy and environmentally aware. I was not disappointed. I started my visit with a short interview with the principal, Fiona Leach. One of my big questions is how often do teachers take their students outside for learning core concepts. Answers for the schools I have visited New Zealand have ranged from two days a week to ever. This school is definitely on the end of the continuum that has every teacher outside everyday with their students. 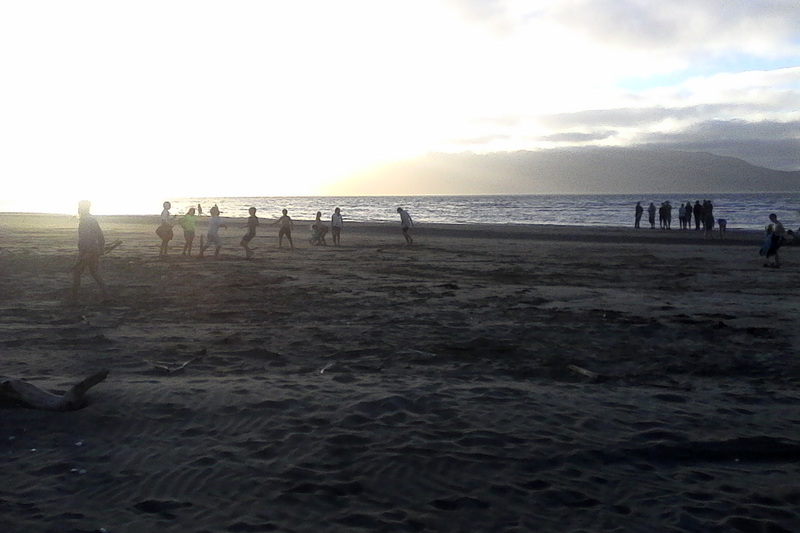 One favorite place for teachers to take their classes is to the beach, which is two blocks away. The school clerk, Jo North, who is the go to person for everything, showed me around the campus. We walked the grounds and she showed me section by section how each and every area was used by the teachers. The front hallway was filled with historic pictures of the town. The classes are able to walk to many of the buildings and sites for hands-on history lessons. They had beautiful gardens built and designed with help from the students. The Garden to Table program worked with the teachers so that now each class uses produce from the garden to make the morning snack for the school once every two weeks. With a tour of the kitchen, it was apparent how much learning, especially math and kitchen safety, was happening in there. The school has no indoor hall for assemblies, so all school presentations and functions take place on colorful benches under a shade/rain tarp. One very unique project that piqued my interest is the planting of a Rongoa (Moari tradition plant medicines) garden. What an amazing learning opportunity that will be when it is complete! One of the many programs that gets students outside for learning at Glenorchy School is their participation in the Enviroschools Program. As part of their Enviroschools journey students in the upper grades have created an app to show their journey towards reaching the Green Gold Award. They are hoping to inspire other schools to do the same. You can get a preview of the app here, or download GY School App from the App Store. More information about Glenorchy's outdoor education programs coming soon!